What activities are permitted in a Foreign-Trade Zone? 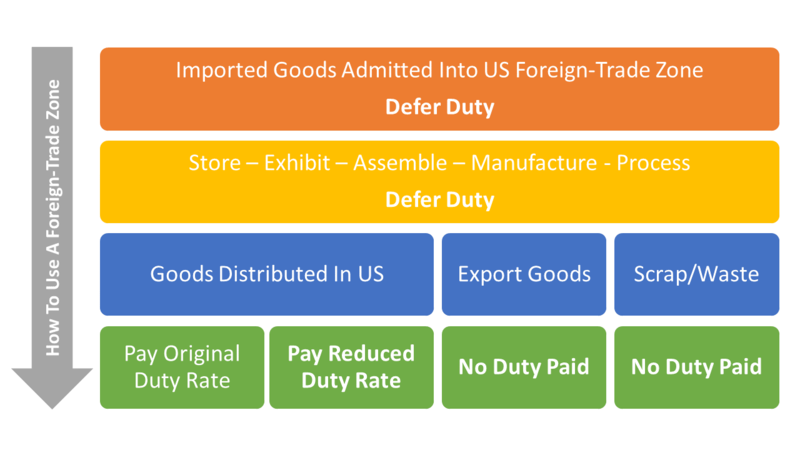 Manufacturing, processing and any activity that results in a change of the tariff classification must be specifically approved by the FTZ Board. Retail trade is prohibited in zones. What kinds of merchandise can be placed in a Zone? Any merchandise that is not prohibited from entry into the U.S. may generally be admitted into a Zone. Although FTZs are considered in international commerce, FTZ sites and facilities remain within the jurisdiction of local, state and/or federal governments and agencies. If applicable, import licenses or permits from other government agencies may still be required. Products may be excluded if agencies determine that zone facilities are inadequate for storage and handling requirements. Products which are deemed detrimental to public health, interest or safety may be excluded by the Foreign-Trade Zones Board. Similarly, the Board may place restrictions upon the zone status and type of operation that may be performed upon certain merchandise.